N deficient potato plants turn a light green to pale yellow. As the severity increases, older leaves turn a deep yellow and may become necrotic and easily separate from the stem, while newer leaves become smaller and curl upward [N35]. Shoot growth is stunted [N27]. Vines die and tubers mature early, reducing tuber bulking duration and decreasing yields [N11, N33]. Fluctuations in N supply during tuber bulking can cause misshapen tubers, brown center and hollow heart [N10]. Nitrogen deficient plants are less efficient at taking up P [N16]. They are more severely affected by Verticillium wilt (Potato Early Dying syndrome), and early blight [N13, N36]. 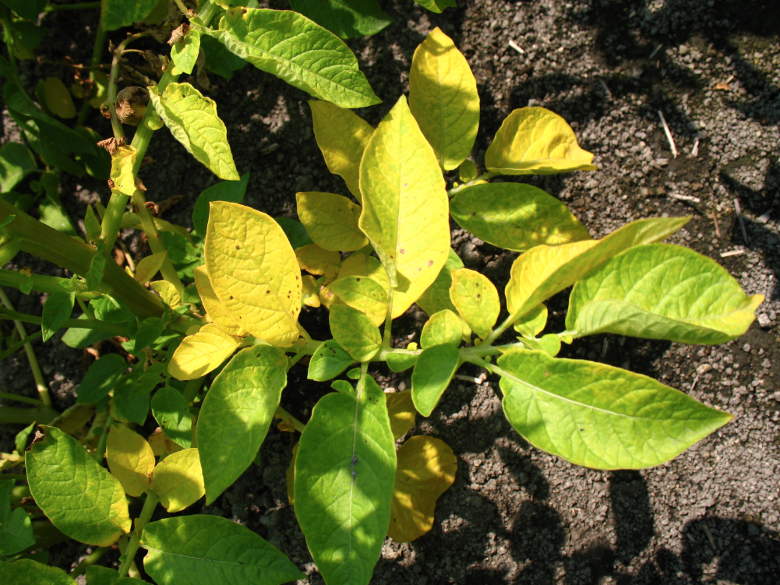 Yellowing on older leaves of an N deficient potato plant (Photo by Daniel Geisseler, UC Davis). 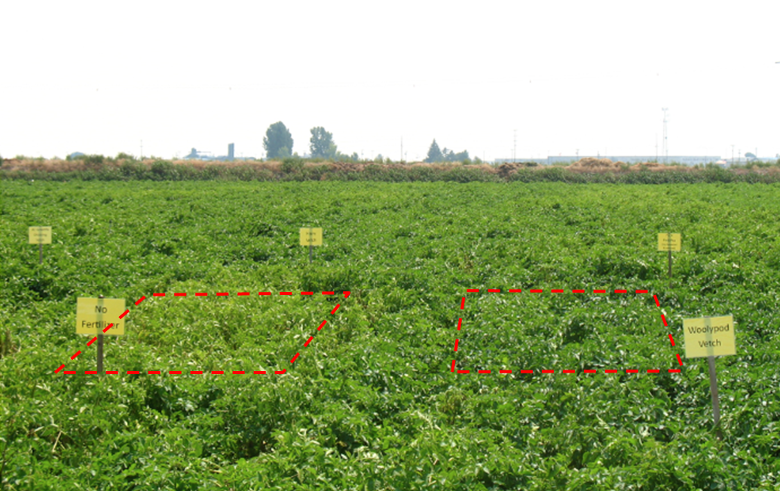 Nitrogen deficient potato plot (left), characterized by uniformly light green foliage, compared to a N sufficent plot (right) (Photo by Daniel Geisseler, UC Davis). Excess N may lead to delayed tuber initiation and maturity, and may create a microclimate conducive for diseases. Excess N both early and late in the season can result in serious yield and quality reductions [N10, N13,N33]. Maturity problems are most serious with indeterminate varieties grown in a short-season environment, and early-harvested potatoes [N27, N30, N33]. Potatoes have a shallow root system and are often grown on sandy soils with sprinkler irrigation, making excess N susceptible to leaching [N36]. Residual soil nitrate concentrations vary considerably from one year to the next and depend on a number of site-specific factors (see Factors Affecting Soil Nitrate Concentrations in Spring). For these reasons, samplesfor residual soil nitrate need to be taken every year from each field, and as close to planting time as possible. Although both nitrate-N and ammonium-N are available to potatoes, only nitrate N is routinely measured, as there is usually little ammonium-N in warm, well-aerated soils [N6]. However, in cool weather, wet soils or when manure or slow-release fertilizer is applied, an important amount of ammonium-N may be present [N14]. Under these conditions, analyzing the samples for nitrate and ammonium may provide a more accurate estimate of residual N availability. Potatoes have a relatively shallow root system, extending to a depth of about 2 feet, with most roots in the top foot of soil [N2,N15,N24]. Therefore, pre- and in-season samples are generally taken to a depth of 1 foot. However, there is some evidence that potatoes are able to access N from deeper in the profile [N24], and sampling to 2 feet in 1-foot increments may provide a more accurate estimate of residual N availability. Nitrate is very mobile in the soil profile and samples taken after harvest for determining residual soil N and potential losses are most informative if taken to 3-4 feet [N14]. Due to the variability of N in the soil, care must be taken that the sample is representative for the field. See Sampling for Soil Nitrate Determination for instructions on sampling methods. Residual soil nitrate is directly available to plants. The nitrate present in the rooting zone can therefore be subtracted from the crop N requirements to determine the amount of fertilizer N that needs to be applied, provided the nitrate is not leached below the root zone with early-season irrigation. Every ppm of soil test N is equivalent to 2-4 lbs N/ acre, depending on soil bulk density [N14]. The lower value is for intensively tilled soils with a high soil organic matter content. That is, a test value of 20 ppm N would mean that 40-80 lbs N /acre may be subtracted from the total N rate. In-season soil analyses are used to monitor N availability to the growing plants, which is especially important where cover crops or organic amendments are used as they release N throughout the season [N14]. Soil nitrate can be compared with published variety-specific N uptake estimates to predict future deficiencies. Periodic deep post-harvest nitrate samples show the residual nitrate-N unused by the crop and are used for assessing the N management system [N14]. High residual nitrate values and accumulation of nitrate below the root zone indicate excess N fertilization or inappropriate irrigation management. Soil samples can be sent to a laboratory or extracted and analyzed on the farm. The soil nitrate quick test with colorimetric test strips is highly correlated with the standard laboratory technique and has been found to be a reliable estimate of current soil N status, with sufficient accuracy for routine on-farm use. Although the quick test is less accurate than a standard laboratory analysis, its accuracy is generally sufficient for routine on-farm use when done correctly. With the quick test soil nitrate can be determined in a timely manner in order to make N fertilization decisions [N7]. For the soil nitrate quick test, 30 mL of a calcium chloride (0.01 M) or an aluminum sulfate (0.025 M) solution are measured into a clean 2-oz bottle or centrifuge tube with a mark at 40 mL. Field moist soil is added until the extractant reaches the mark. The tube is then capped and vigorously shaken for about 1 minute to disperse all soil aggregates. The soil particles are allowed to settle until clear supernatant forms. The nitrate concentration in the supernatant can be measured with nitrate-sensitive colorimetric test papers [N7]. More detailed instructions can be found here. Potato petiole samples should be taken at several different growth stages, so that the trend over time may be observed. Growers commonly take petiole samples for nitrate analysis from 3 to 7 times during the season. If only one petiole nitrate sample is feasible, it is best to take a sample at tuber initiation as this has been shown to correlate best with yields in most areas [N18,N36]. However, petiole samples at mid-bulking, late bulking, and maturity are often needed to make sure the fertilizer program resulted in a decline in petiole nitrate from early bulking to levels recommended for the variety [N36]. The field is divided into blocks that have a similar management history, variety and soil conditions. Problem areas should be sampled separately. The fourth petiole from the top of the plant is used. The leaves are stripped off immediately to avoid translocation of nitrate into the leaves. Petioles from about 40 randomly selected plants from across the field should be taken per sample. Samples are briefly washed in distilled water and either placed in clean paper bags and dried at 60-70Â° C or kept cool until they are submitted. For more information on sampling procedure, see Plant Tissue Sampling. Petiole nitrate is affected by weather conditions, time of day and plant stress and disease. Thus, it is most informative to take repeated samples in the same area and at the same time of day [N14]. Disease rather than low soil available N may be causing low petiole nitrate, especially late in the season. This problem may be detected by taking soil samples at the same time as the petiole samples, using the same sampling scheme [N10]. See Soil Test N: In-season for more information. In a FREP-funded study conducted in 2000-2003 on several potato varieties at sites in Yolo and Kern counties, Tulelake and the Stockton Delta, Voss [N36] found the following critical ranges to be associated with 'Russet Norkotah' and 'Red LaSoda' potatoes. Petiole nitrate thresholds for 'CalWhite' and 'CalRed' varieties are similar to those in 'Russet Norkotah' but are likely on the low end of the range [N36]. "Early", "mid" and "late" season are 55, 75 and 90 days after planting, respectively, roughly corresponding to early tuber initiation, early tuber bulking, and mid tuber bulking stages. Critical petiole nitrate ranges for selected California potato varieties [N36]. However, since there is considerable variation between sites, soil types and potato varieties, the best practice is for each grower to keep records of seasonal petiole nitrate values, soil nitrate, and tuber yields and quality to obtain more site-specific values [N36]. Potatoes normally benefit from split N applications. Experience with russet varieties in the Tulelake area suggests that for long season varieties about 50% of the total rate should be applied at planting (Rob Wilson, personal communication). The proportion of pre-plant N should be higher with short-season varieties, as they use more N earlier in the season and are less sensitive to excess early-season N [N12]. In Tulelake, the highest yields for short-season potatoes are often obtained when 60%-100% of the total rate is applied pre-plant (Rob Wilson, personal communication). For Russet Norkotah in the Pacific Northwest, the recommendation is that 2/3-3/4 should be applied pre-plant [N3]. On very sandy soils, relatively less of the N rate should be applied at or before planting [N10]. See Soil-Applied N for recommended total N rates. Nitrogen available from non-fertilizer sources should be included as part of the total N rate. In soils with high available N, a pre-plant application may be unnecessary and may even produce lower yields and reduce U.S No.1s compared with split applications [N37]. The optimum N rate and timing differ greatly among varieties [N36]. Specific recommendations on appropriate N rates, timing and target petiole concentrations based on research done in the Pacific Northwest are available for several common russet potato varieties. While these have not been tested in California, they may provide growers with a good place to start. A summary of this research is available here. Pre-plant N is often broadcast along with other preplant fertilizers, and should be incorporated into the top 6-12 inches of soil, either mechanically or with irrigation water [N31]. A variety of N-containing fertilizers are available to growers. Research suggests that they are equally effective if used appropriately, and that the decision may be made based on cost and ease of application [N10, N14]. For pre-plant applications in sandy soils, ammonium may be preferred over nitrate and urea because it is less at risk of leaching [N14, N19]. However, in warm soils, ammonium is generally quickly converted to nitrate. Controlled release fertilizers (CRFs) such as polymer-coated urea may reduce early-season leaching losses and increase N use efficiency [N9, N20, N32]. While some efficiency improvements have been documented in other states [N4, N32], research in California has not so far demonstrated that there is an advantage to using CRFs compared with the less expensive practice of fertigating most of the N in-season [N9]. More information on N fertilizers may be found at the website of the IPNI. It is usually not efficient to apply the entire N requirement at planting. On a fine sandy loam soil in Kern County, Lorenz and coworkers [N19] observed that when 120 lbs N/acre was banded as either ammonium sulfate or urea, about 80% of the N had been nitrified and leached by 40 days after planting. A general recommendation is to apply about 50% of the total N rate prior to or at planting, with the remainder applied during the tuber initiation and tuber bulking stages [N31] (See Pre-plant N and Soil-Applied N). A larger proportion of the fertilizer requirement should be applied at or before planting with short season, determinate varieties [N14]. Starter N is normally banded. Bands should be located at least 2 inches away from the seed, on one or both sides [N16, N28]. There is debate on whether the band should be above or below the seed piece. Potato seed, unlike that of most field crops, germinates upwards and early roots are mostly located above the seed piece [N12]. Some research in Idaho suggests that it is more efficient to place the fertilizer band 2 inches above the seed piece than level with the seed piece [N14]. However, experiments in Kern County in the 1940s and 1950s found that yields were higher when the band was level with or slightly below the seed, compared with bands placed either 2 inches above or 4 inches below [N17]. Diammonium phosphate (DAP), urea and urea ammonium phosphate (UAP) may give off free ammonia which is toxic to the seed piece, and if used the band should be placed further away [N28]. Liquid fertilizers containing N and P, such as a 10-34-0 solution, are often used in starter bands [N31]. Starter blends containing N and P can assist in P uptake leading to better root development. Banded fertilizers containing diammonium phosphate (DAP), urea ammonium phosphate (UAP) and urea may injure seeds and reduce yields, especially in coarse, alkaline or dry soils or if they are placed too close to the seed [N21]. The fertilizer N required to grow a potato crop varies considerably with variety, growing location and year [N10,N36]. A 400 cwt/ acre crop requires approximately 160-240 lbs/acre N from all sources [N10]. This N may be partly or completely supplied by residual soil nitrate, nitrate in the irrigation water, as well as N mineralized during the growing season from soil organic matter, crop residues, and organic amendments [N36]. The fertilizer rate is derived by subtracting the N likely to be available from these sources from the total predicted crop need. This value is then adjusted for fertilizer N use efficiency, which under good management ranges around 60-80% [N26,N29,N38]. More information on site-specific adjustments can be found here. This predicted rate can then be adjusted based on in-season petiole analyses, and its appropriateness assessed by a post-season soil nitrate test. (See Soil and Petiole N Analyses) [N36]. For more information on the N requirements for varieties in your area, contact your local farm advisor. Since almost all potatoes in California are sprinkler or drip irrigated, in-season N is normally applied through fertigation [N34,N36]. Potatoes can take up N as both ammonium and nitrate, although nitrate appears to be the major form used [N26]. Ammonium (and urea, which is quickly transformed to ammonium in soil) may interact with the mineral soil and not be immediately available for plant use [N25]. However, in warm aerated soils ammonium is quickly converted to nitrate, and the form applied is not likely to matter much [N10]. For drip- irrigated vegetables, Hartz and Hochmuth [N8] recommend that in cool weather, in-season N applications should have at least 25-50% of the N in nitrate form, but that in warmer weather higher proportions of ammonium and urea may be used. For fertigation, common materials include ammonium nitrate, urea ammonium nitrate solutions such as UAN-32, calcium nitrate and potassium nitrate [N8]. Ammonium sulfate acidifies the soil and its use may reduce scab severity, as scab is controlled by lowering the soil pH [N11]. More information on N fertilizers may be found at the website of the IPNI. Potatoes have a shallow root system and are often grown on sandy soils from which excess N is easily leached. For these reasons N application timing must closely match plant uptake for good N use efficiency. Most nutrients required from germination until emergence are contained in the seed piece, but for good tuber set and quality, potatoes need a steady stream of N from the soil during canopy development, tuber initiation and early bulking stages. Sidedress N and N fertigation should therefore be timed to maintain an adequate N supply during this period of high N demand [N12]. Since varieties differ in their N uptake rates, application decisions are guided by frequent petiole analyses (See Petiole Analysis). During the late tuber bulking and maturation stages the root system begins to decay and potato plants take up little N [N24]. Excess late season N may re-stimulate growth in decaying vines, reducing tuber dry matter accumulation. Fertilizer should not be applied from late tuber bulking through maturity [N12]. For more information see Nitrate Uptake and Partitioning. Foliar sprays of N may be useful in treating in-season deficiencies, and in improving N status of potatoes whose ability to take up N from the soil is reduced by pests, diseases or soil conditions [N5,N22,N23,N31]. However, there is no evidence that spraying N foliarly is more efficient than other methods of in- season application, especially as fertigation via sprinkler also results in some foliar uptake. In general fertigation and sidedressing are less expensive and are preferred when possible [N1]. Lorenz [N17] observed that leaf scorch usually occurred when a 44% N commercial urea product was applied at a rate of 20 lbs/100 gallons of water, but rarely at a rate of 10 lbs/100 gallons of water. As leaf scorch occurs more when air temperatures are high, foliar applications should be made in the morning or evening [N17]. Phosphorus is important for early root and canopy development and tuber initiation, and strongly influences tuber set [P16]. Foliar symptoms of P deficiency in potato are not easy to recognize. Phosphorus deficient potato plants are slightly stunted, with darker green foliage. Stems and lower leaf surface may also turm purple. As the deficiency becomes severe leaves cup upwards, exposing a grey-green color on the lower leaf surface [P20]. Harvested tubers tend to have small brown internal spots. Tubers are smaller, with lower specific gravity [P7]. Severe P deficiencies may exacerbate severity of potato early dying syndrome (Verticillium wilt) [P8]. 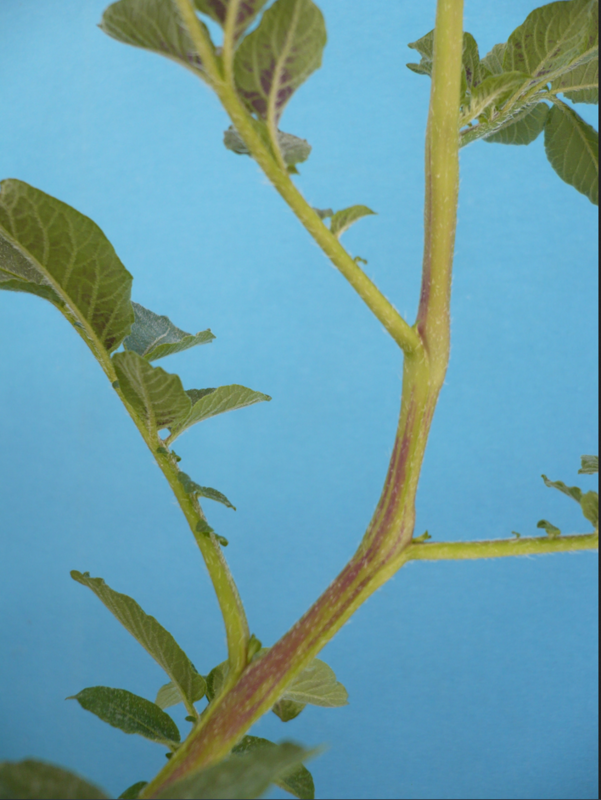 Phosphorus deficient potato plant with purple stem and lower leaf sruface (photo provided by the International Plant Nutrition Institute). As potato plants often respond to high rates of P fertilizer but are inefficient at using it [P3, P14], growers may be tempted to apply P in excess of demand, which may over time increase the risk of surface water contamination. This is especially a danger when potatoes are grown with frequent manure applications [P3]. Potatoes have a shallow root system, and take up almost all their P from the top foot of soil [P17]. Therefore, samples are generally taken to a depth of 1 foot. Soil samples can be taken at any time between crops, as soil P and K change less rapidly than nitrate [P4]. However, they should be taken at the same time each year. See Soil Test Sampling for sampling instructions. In California, the available soil P is generally determined by extracting the soil samples with a bicarbonate solution (Olsen-P test). The Olsen-P test works well in soils with pH 6.5 and above and with less than 3% organic matter [P15]. Consult your local farm advisor for appropriate soil testing when soil pH is below 6.5, or on organic soils like peats or mucks. In general, soils with Olsen-P values greater than 25 ppm are unlikely to respond to P applications. However, this depends on soil type [P13]. On sandy soils, response to P fertilizer is not likely above 20 ppm. On non-sandy or calcareous soils, responses may be seen up to 30 ppm [P18]. 'Russet Burbank' potatoes are known to be poor P scavengers, and tend to have comparatively high critical values [P20]. For low to moderate Olsen-P values, P rate may be based on the P removed with the harvested tubers. See Pre-Plant P: Rate. For Olsen-P values below 12 ppm, and in calcareous soils when fertilizer is broadcasted rather than banded, the rate should be increased. Regular soil analyses and in-season petiole tests indicate whether the P fertilization program is adequate. Over the long term, the Olsen-P values should remain in the optimal range of 12-25 ppm. Even in high testing soils, potatoes may benefit from a small starter P application. Since P fertilizer is ideally applied before planting, soil tests are the primary P management tool. However, petiole P analyses can help predict in-season deficiencies and show whether adjustments need to be made to the P management program [P6]. Potato petiole samples may be taken at several different growth stages, so that the trend over time may be observed and deficiencies may be predicted before they occur [P6, P9]. Since fertigated P may not improve P status for over a week, by the time deficiencies are observed it may already be too late to prevent yield reductions. Growers commonly take petiole samples for analysis 3- 7 times during the season, beginning at tuber initiation and continuing through the tuber growth period [P21]. If only one petiole sample is feasible, it is best to take a sample at tuber initiation as this normally has the best correlation with yields for both N and P [P12]. It is most informative to take repeated samples in the same area and at the same time of day [P10]. If petiole values show P to be deficient or trends over time predict that it is likely to become so, in-season P may be applied. Low petiole P concentrations also indicate that the pre-plant rate should be increased or the application method improved [P6]. Petiole nutrient critical values for potato [P12]. Appropriate P rates are based on yield expectations and soil test P. When soil test P is adequate, P fertilization may be based on loss with the harvested tubers. A general guideline is that about 5 to 7 lbs P (11.5 to 16 lbs P2O5) are removed with every 100 cwt of tubers [P11, P17]. This in line with findings by Lorenz [P10] in Kern County that 27 lbs P/ acre (62 lbs/ acre P2O5 ) were removed with a 400 cwt/acre crop of 'White Rose' potatoes. More fertilizer may be required on deficient soils, fine-textured soils or when all P fertilizer is broadcasted rather than banded [P17]. As P reacts with the free lime and becomes unavailable, higher rates may also be appropriate on calcareous soil [P18]. Since actual potato P uptake per unit of yield depends on the variety and soil type, the P management program should be adjusted based on soil test P values and petiole analyses [P17]. If manure is used, much of this P is available and should be included in the total P rate [P2, P17]. Phosphorus fertilizers applied prior to planting are usually broadcast with other pre-plant fertilizers and incorporated into the top 6-12 inches of soil for good root contact [P18]. Potato roots take up almost all their P from the top foot of soil, so deeper incorporation is not beneficial [P18]. In high testing soils some band-applied starter P may be beneficial, but broadcast applications are not needed [P6,P17] (See Starter P) While usually the whole rate may be safely banded, broadcasting some P pre-plant may be beneficial in low to moderate testing soils, as long as they do not strongly retain P [P6]. Broadcasting ensures a good supply of P throughout the rooting area and encouraging the roots to grow into the furrow [P6, P9]. Choice of preplant P fertilizer may be made based on price, convenience and availability [P17]. Fact sheets of the most common fertilizers can be found on the web site of the IPNI. Preplant P is usually applied at bed formation, but since P is not mobile in the soil, it may be broadcast and incorporated any time prior to planting [P7, P17] . While some additional P may be side-dressed or fertigated in-season to correct deficiencies that develop, it is more effective to apply sufficient P as preplant or starter fertilizer. In-season applications should only be done as an emergency measure [P17]. Normally, the entire rate may safely be banded. Even in relatively high-testing soils, potatoes may benefit from some starter P. As a general guideline for U.S. potato production Rosen and coworkers [P17] suggest that 18-27 lbs/acre P2O5 be banded at planting. See Soil Test P for more information. Banding P at planting can be more efficient than broadcasting. Phosphorus is sometimes held strongly on soil surfaces, especially in acid or calcareous soils. Applying P fertilizer in concentrated bands allows the fertilizer to exceed the soil's P retention capacity and increases P availability. This is especially important early in the season, when the root system is small but a good P supply is important. The fertilizer band should not be in direct contact with the seed [P18]. Bands may be made on one or both sides of the seed and should be located at least 2 inches to the side [P10, P17]. Diammonium phosphate (DAP), urea and urea ammonium phosphate (UAP) may give off free ammonia which is toxic to the seed piece. If these are used the band should be placed further away [P17]. If fertilizer is banded prior to planting, at row formation, the band should be located about 2-4 inches below the planting depth so that it is not disrupted by the planter [P6]. A number of granular and liquid P fertilizers are available. When ammonium-N and P are applied together, uptake of both nutrients is increased [P6, P10]. Including an acidifying N source such as ammonium sulfate in calcareous soils may also increase P availability [P9, P11]. Urea ammonium phosphate (UAP) or diammonium phosphate (DAP) give off free ammonia which can damage the seed, and should not be banded at high rates (>240 lbs P2O5/ acre) or less than 2 inches from the seed, especially in sandy soils [P17] . Fact sheets of the most common fertilizers can be found on the web site of the IPNI. Since P is important to early season root growth, canopy development and tuber set and is not likely to leach, it is best to apply the entire requirement preplant or at planting [P6]. Splitting P applications does not appear to increase P use efficiency [P5]. However, in-season P may increase yields in deficient crops [P6] . If P is required in-season to correct deficiencies, it may be added with irrigation water. Since P is immobile in soil and will not wash in more than a few inches, fertigation is only effective if active roots are near the surface, which starts to occur when the canopy begins to shade the hill [P7]. Petiole P concentrations begin to respond about 10-14 days after fertigation [P18]. Phosphorus can form precipitates that block emitters, and care should be taken to choose a P fertilizer that is compatible with the irrigation water chemistry [P17]. P may be sidedressed; however, since it must be mechanically incorporated application should be done while roots are still small to avoid root pruning. For example, it may be incorporated into the soil during the hilling process [P6]. Potato plants can respond to foliar P [P13], and foliar P applications may be useful if disease or environmental stress prevent good root uptake or if the initial application was too low [P6,P9]. However, little P can safely be applied this way and the quantity may be too small to affect yields [P1,P14,P17]. Therefore, while foliar P may be applied as a rescue measure for deficient plants, it is less effective than an adequate soil application [P6]. In the early stages of K deficiency, young, fully expanded leaves appear glossy, with a dark black or bluish pigmentation and leaf crinkling. As the deficiency becomes more severe marginal leaf appears and leaves may become necrotic and drop off [K25, K27]. Leaves may have a bronzed appearance [K25]. Potassium deficiencies affect yield and tuber quality characteristics such as size, specific gravity, black spot bruise susceptibility, chip and fry color and storage quality [K10,K16]. The peat soils of the Delta are naturally poor in K, and tend to respond to K fertilizer [K13]. 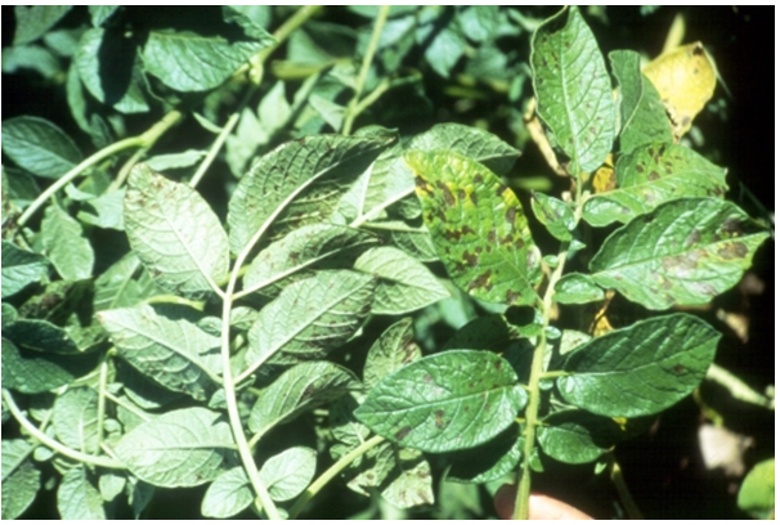 Potassium deficient potato plant (photo provided by the International Plant Nutrition Institute). Excess K can decrease tuber specific gravity and dry matter, as the surplus K is transported to the tubers, increasing water absorption [K24]. This effect may be stronger for K fertilizers with a high salt index such as KCl [K10], although it appears to vary by region [K2]. Excess K may also decrease tuber size [K21]. Potatoes have a shallow root system, and samples are generally taken to a depth of 1 foot. Soil samples can be taken at any time between crops, as soil P and K change less rapidly than nitrate [K4]. However, soil samples should be collected at the same time each year [K20]. See Soil Test Sampling for sampling instructions. In California, soil available K is normally measured as ammonium-acetate extractable K [K17]. The K rate should be based on the K removed with the harvested tubers (See Preplant K:Rate). While potatoes grown in soils with K values greater than 150 ppm ammonium-acetate extractable K have traditionally been considered unlikely to respond to K applications [K14], a heavy crop can draw down soil K quickly and it may be safer to manage K so as to keep levels greater than 150 ppm [K17,K23]. Soil critical values for potatoes [K17]. Potato petiole samples may be taken at several different growth stages, so that the trend over time may be observed and deficiencies may be predicted before they occur [K5,K11]. Growers commonly take petiole samples for analysis 3-7 times during the season, beginning at tuber initiation and continuing through the tuber growth period [K28]. If only one petiole sampling is feasible a late-season petiole sample is best, as late-season petiole K tends to correlate better with crop performance than early-season K [K14]. However, as potatoes take up little K beyond about the middle of tuber bulking, this is more informative for adjusting the K fertilization program than for correcting current year deficiencies [K6]. It is most informative to take repeated samples in the same area and at the same time of day [K10]. For more information on sampling procedure, see Plant Tissue Sampling. If petiole values show K to be deficient or trends over time predict that it is likely to become so, in-season K may be applied. Low petiole K concentrations also indicate that the pre-plant rate should be increased or the application method improved. Petiole K does not have as strong a correlation with yields as do petiole nitrate and P.
Petiole critical nutrient values for potato [K16]. Potatoes take up more K than any other nutrient, and most of it is removed with the tubers [K6] . Although many California potato-growing areas have high K soils and yields may not increase with K fertilizer addition, the soil may become depleted over time if the K removed with the harvest is not replaced [K13,K26]. Potato K uptake differs with cultivar and K supply, but on average potato tubers remove about 40-70 lbs of K2O for each 100 cwt of yield [K13,K24] . Therefore in a non-deficient soil, about 160-280 lbs/acre available K2O would be required to replace K removed with a 400 cwt/acre crop. This rate may be adjusted upwards or downwards to maintain soil test K in the optimum range. See Soil Test K for more information. Potassium is not very mobile in soil, and broadcast applications should be incorporated to a depth of 6-12 inches for good root accessibility [K6]. In general, choice of K fertilizer can depend on price and convenience of application [K24]. However, potatoes are slightly sensitive to salt, and potassium chloride (KCl) has a high salt index. If very high rates (>300 lbs/acre K2O) of K are used, potassium sulfate (K2SO4) or a blend of K2SO4 and KCl tend to give higher yields and tubers with higher specific gravity than KCl alone [K7,K8,K23]. Potassium sulfate may also be a better choice where soils or irrigation water are saline [K23]. Depending on the soil type and other fertilizers applied a blend of K2SO4 and KCl can also be beneficial, as both chloride and sulfate ions are also required nutrients for potato [K6]. Potassium nitrate (KNO3) and potassium thiosulfate (KTS) are also used. More information on K fertilizers may be found at the IPNI website. Since K does not leach much in the soil, except in very sandy soils, K fertilizer may be applied any time prior to final ground preparation [K6]. If more than 300 lbs K2O/ acre are broadcast and incorporated shortly before planting, the seed pieces may be adversely affected [K20]. For spring-planted potatoes, applying half the rate the preceding fall and half in spring will reduce this danger [K24]. In general, it is considered most effective to broadcast and incorporate K prior to planting. While large applications at planting have been observed to decrease yields and tuber size [K20], some starter K may be beneficial in very low K-testing soils [K18,K24]. The band should contain no more than 50 lbs/acre K2O, since higher concentrations may cause salt damage to the seed [K24]. Fertilizer bands should be located at least 2 inches to the side and either level with or a little below the seed, and may be made on one or both sides [K12,K19]. More potassium sulfate can safely be added to the fertilizer band than potassium chloride [K23]. Little research has been done on the effectiveness of in-season K application to California potatoes. The available evidence from other states suggests that for very low-testing soils in-season K may be helpful in sustaining high yields, but when soil K is adequate there is no clear benefit, even on sandy soils, to fertilizing in-season rather than applying the whole requirement pre-plant [K1,K2,K7,K15,K21,K22]. Research by Davenport and Bentley [K1] with 'Russet Burbank' potatoes on a fine sandy soil in Washington found that tuber total and marketable yields were reduced in some years when more than 50% of the crop's K requirement was applied in-season, especially when potassium chloride (KCl) was used. For 'Russet Burbank' potatoes in the Pacific Northwest, Stark and coworkers [K24] recommend that no more than 50 lbs/ acre K2O be applied in-season to avoid risk of yield reductions. However, on low-testing (68-101 ppm K) sandy soils in Oregon, Horneck [K7]. found that while specific gravity was reduced when KCl was applied at rates greater than 300 lbs K2O/acre, yields were increased at rates of up 600 lbs K2O/acre. Yields in this study were very high, ranging between 600-800 cwt/acre [K7]. In-season K may be incorporated into the soil or fertigated during the season. Since K is not very mobile in most soils, sprinkler K applications tend to be effective on sandy soils, where K is more likely to be washed into the root zone [K6] . Research with Russet Burbank potatoes in the Pacific Northwest suggests that when 50% or more of the K requirement is supplied in-season, potassium sulfate is a safer choice than potassium chloride [K1], and is less likely to reduce specific gravity [K7]. Potassium magnesium sulfate (K-mag) has a little chloride, but is safe unless it is applied at very high levels, over 600 lbs K2O/acre [K7]. However, at low rates there is likely little difference between fertilizer sources. Potassium thiosulfate (KTS) and potassium nitrate (KNO3) are also used [K24]. To prevent root pruning, K that is side-dressed and incorporated should be applied while the roots are still small, for example at hilling [K5]. In most soils K is relatively immobile, moving only a few inches annually. Therefore, sprinkler-applied K is only effective if active roots are near the surface. Potato root density near the surface starts to increase when the canopy begins to shade the hill. Potatoes do not take up much soil K after about the middle of tuber bulking, and applications close to maturity are unlikely to be effective [K6]. Little research has been done on foliar K applications to potato. An experiment on a K deficient soil in Pakistan found that potatoes receiving a basal dose of 133 lbs/acre K2O plus foliar applications of a 1% K2O solution 30, 40 and 60 days after emergence had higher yields than potatoes receiving only the basal dose. Yields were slightly higher when the source was potassium sulfate than when it was potassium chloride [K9]. However, because not much K can be absorbed by potato leaves, in-season application of foliar K is unlikely to meet tuber demand. An adequate preplant application is preferred [K3,K10] . "Foliar fertilization: Can potato growers benefit?" Potato Grower Magazine, December 2010. Accessed 7/2/2015. Ahmadi, S.H., Sespakhah, A.R., Andersen, M.N., Plauborg, F., Jensen, C.R., Hansen, S., 2014. Modeling root length density of field grown potaotes under different irrigation strategies and soil textures using artificial neural networks. Field Crops Research 162, 99-107. Atkinson, D., Geary, B., Stark, J., Love, S., Windes, J., 2003. Potato varietal responses to nitrogen rate and timing. Presented at the Idaho Potato Conference, 1/22/2003. Gaskell, M., Hartz, T., 2011. Application of the "4R" nutrient stewardship concept to horticultural crops: selecting the "right" nutrient source. HortTechnology 21, 663-666. Hartz, T.K., 2010. Using the pre- sidedressing soil nitrate 'Quick Test' to guide N fertilizer management. Hartz, T.K., Hochmuth, G.J.,1996. Fertility management of drip-irrigated vegetables. HortTechnology 2, 27-32. Hopkins, B., Stark, J., 2010. Potato Nutrition. In: Bohl., W.H., Johnson, S.B., (Eds.). Commercial Potato Production in North America. American Potato Journal Supplement Vol. 57, second revision. pp. 57-62. Kleinschmidt, G.D.,1984. Starter Fertilizer for Optimum Potato Yields. Proceedings of the University of Idaho Winter Commodities Schools, 1984. Lambert, D.H., Powelson, M.L., Stevenson, W.R., 2005. Nutritional interactions influencing diseases of potato. American Journal of Potato Research 82, 309-319. Lesczynski, D.B., Tanner, C.B., 1976. Seasonal variation of root distribution of irrigated, field-grown Russet Burbank potato. American Potato Journal 53, 69-78. Lorenz, O.A., 1944. Studies on potato nutrition: I. The effects of fertilizer treatment on the yield and composition of Kern County potatoes. American Potato Journal 21, 179-192. Lorenz,O.A., Bishop, J.C., Hoyle, B.J., Zobel, M.P., Minges, P.A., Doneen, L.D., Ulrich, A., 1954. Potato fertilizer experiments in California. California Agricultural Experiment Station Bulletin 744. Lorenz, O.A., Weir, B.L., Bishop, J.C., 1974. Effect of sources on nitrogen on yield and nitrogen absorption of potatoes. American Potato Journal 51, 56-65. Maharjan, B., Venterea, R.T., Rosen, C., 2014. Fertilizer and irrigation management effects on nitrous oxide emissions and nitrate leaching. Agronomy Journal 106, 703-614. Meisinger, J.J., Bouldin, D.R., Jones, E.D., 1978. Potato yield reductions associated with certain fertilizer mixtures. American Potato Journal 55, 227-234. Millard, P., Robinson, D., 1990. Effect of the timing and rate on nitrogen fertilization on the growth and recovery of fertilizer nitrogen within the potato (Solanum tuberosum L.) crop. Fertilizer Research 21, 133-140. Pan, W.L., Bolton, R.R., Lundquist, E.J., Hiller, L.K., 1998. Portable rhizotron and color scanner system for monitoring root development. Plant and Soil 200, 107-112. Roberts, S., Cheng, H.H., Buttler, I.W., 1992. Recovery of starter nitrogen-15 fertilizer with supplementarily applied ammonium nitrate on irrigated potato. American Potato Journal 69, 309-314. Roberts, S., Cheng, H.H., Farrow, F.O., 1991. Potato uptake and recovery of nitrogen-15-enriched ammonium nitrate from periodic applications. Agronomy Journal 83, 378-381. Rosen, C.J, Kelling, K.A., Stark, J.C., Porter, G.A., 2014. Optimizing phosphorus fertilizer management in potato production. American Journal of Potato Research 91, 145-160. Shahnazari, A., Ahmadi, S.H., Laerke, P.E., Liu, F., Plauborg, F., Jacobsen, S.-E., ... Anderson, M.N., 2008. Nitrogen dynamics in the soil-plant system under deficit and partial root- zone drying irrigation strategies in potatoes. European Journal of Agronomy 28, 65-73. Stark, J.C., Porter, G.A., 2005. Potato nutrient management in sustainable cropping systems. American Journal of Potato Research 82, 329-338. Stark, J., Westermann, D., Hopkins, B., 2004. Nutrient management guide for Russet Burbank potatoes. University of Idaho extension bulletin 840. Taysom, T.W., Hopkins, B.G., Shiffler, A.K., Stephens, S.C., 2007. Polymer coated urea in potato production. Western Nutrient Management Conference 7, 169-175. Timm, H., Doneen, L.D., Lyons, T., Bishop, J.C., Schweers, V.H., Stockton, J.R., 1960. Potato quality lowered in field tests with high nitrogen fertilization. California Agriculture 14, 13-13. Tindula, G.N., Orang., M.N., Snyder, R.L., 2013. Survey of irrigation methods in California in 2010. Journal of Irrigation and Drainage Engineering 139, 233-238. Ulrich, A., 1993. Potato. In: Bennett, W.F., (Ed.). Nutrient Deficiencies and Toxicities in Crop Plants. The American Phytopathological Society, St. Paul., MN. pp 149-156. Wilson, R., Culp, D., Nicholson, K., 2012. Classic Russet and Russet Norkotah potato yield and quality response to nitrogen fertilization. UC ANR Research Report #151, 2012. Zebarth, B.J., Leclerc, Y., Moreau, G., 2004. Rate and timing of nitrogen fertilization of Russet Burbank potato: Nitrogen use efficiency. Canadian Journal of Plant Science 3, 845-854. Allison, M.F., Fowler, J.H., Allen, E.J., 2001. Effects of soil- and foliar- applied phosphorus fertilizers on the potato (Solanum tuberosum) crop. Journal of Agricultural Science, Cambridge 137, 379-395. Curless, M.A., Kelling, K.A., Speth, P.E., 2004. Nitrogen and phosphorus availability from liquid dairy manure to potatoes. American Journal of Potato Research 82, 287-297. Davenport, J.R., Milburn, P.H., Rosen, C.J., Thornton, R.E., 2005. Environmental impacts of potato nutrient management. American Journal of Potato Research 82, 321-328. Hartz, T.K., 2007. Soil testing for nutrient availability procedures and interpretation for California crop production. Hopkins, B.G., Ellsworth, J.W., Bowen, T.R., Cook, A.G., Stephens, S.C., Jolley, V.D.,... Eggett, D.,2010. Phosphorus fertilizer timing for Russet Burbank potato grown in calcareous soil. Journal of Plant Nutrition 33, 529-540. Hopkins, B., Stark, J., 2010. Potato Nutrition. In: Bohl., W.H., Johnson, S.B., (Eds.). Commercial Potato Production in North America. American Potato Journal Supplement Vol. 57, 2nd revision. pp. 57-62. Pursglove, J.D., Sanders, F.E., 1981. The growth and phosphorus economy of early potato (Solanum tuberosum). Communications in Soil Science and Plant Analysis 12, 1105-1121. Reisenauer, H.M., Quick, J., Voss, R.E., Brown, A.L., 1976. Soil test interpretive guides. In: Reisenauer, H.M. (Ed.). Soil and Plant-Tissue Testing in California. University of California, Division of Agricultural Sciences, Bulletin 1879. pp. 38-40. Rosen, C.J., Bierman, P.M., 2008. Potato yield and tuber set as affected by phosphorus fertilization. American Journal of Potato Research 85, 110-120. Stark, J., Westermann, D., Hopkins, B., 2004. Nutrient management guide for Russet Burbank potatoes. University of Idaho Extension Bul. 840. Thornton, M.K., Novy, R.G., Stark, J.C., 2014. Improving phosphorus use efficiency in the future. American Journal of Potato Research 91, 175-179. Davenport, J.R., Bentley, E.M., 2001. Does potassium fertilizer form, source and time of application influence potato yield and quality in the Columbia basin? American Journal of Potato Research, 78, 311-318. Davenport, J.R., Bentley, E.M., Whitley, K.M., 2001. Potassium fertilizers and potato yield and quality in the Columbia basin. Horneck, D., 2010. Potassium and chloride in potatoes: Data from the PNW. Plant Management Network, International. Horneck, D., Rosen, C., 2008. Measuring nutrient accumulation rates of potatoes-tools for better management. Better Crops 92, 4- 6. Laboski, C.A.M., Kelling, K.A., 2007. Influence of fertilizer management and soil fertility on tuber specific gravity: a review. American Journal of Potato Research 84, 283- 290. Mohr, R.M., Tomasiewicz., D.J., 2012. Effect of rate and timing of potassium chloride application on the yield and quality of potato (Solanum tuberosum L., 'Russet Burbank'). Canada Journal of Plant Science 92, 783-794. Oswald, J.W., Lorenz, O.A., Bowman, T., Snyder, M., Hall, H., 1958. Potato fertilization and internal black spot. California Agriculture 12, 8-10. Rosen, C., McNearney, M., Bierman, P., 2012. Optimizing potassium management for irrigated potato production: Russet Burbank. Research Report to the Northern Plains Potatao Grower's Association. Rosen, C., McNearney, M., Crants, J., Bierman, P., 2015a. Optimizing potassium management for irrigated potato production: Red Norland. In: Northern Plains Potato Growers Association 2015 Research Reports. Rosen, C., McNearney, M., Crants, J., Bierman, P., 2015b. Optimizing potassium management for irrigated potato production: Russet Burbank. In: Northern Plains Potato Growers Association 2015 Research Reports. Snyder, C., 2010. Potassium and potatoes. Western Farm Press April 26, 2010. Accessed 6/15/2015. Trehan, S.P., Roy, S.K., Sharma, R.C., 2001. Potato variety differences in nutrient deficiency symptoms and responses to NPK. Better Crops International 15, 18-21. Tyler, K.B., Lorenz, O.A., Nelson, P.M., Bishop, J.C., 1959. Soil potassium for potatoes: Depletion of soil potassium by cropping necessitates potash fertilization in certain areas of Kern and Tulare counties. California Agriculture 12, 8-8.